8 + 8 = Required Please enter the correct value. 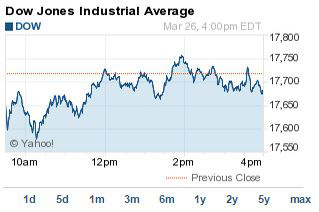 The DJIA today managed to bounce back from early triple-digit losses but still closed down 39 points. The S&P 500 struggled to its fourth-straight daily decline. Investors brushed aside concerns about a pending interest-rate hike by the Federal Reserve and jitters over the upcoming earnings season. What Moved the DJIA Today: Upbeat economic data provided optimism for future growth in the U.S. economy, but concerns about a pending interest hike continue to weigh on the financial markets. This morning, the Commerce Department said unemployment claims fell last week at a faster rate than anticipated. In addition, growth in the services sector hit a six-month high. Still, investors remain concerned over first-quarter growth. Earnings season is approaching, and corporate revenue growth faces four distinct challenges: bad weather, the now-settled labor dispute at western U.S. ports, a strong U.S. dollar, and weakening global demand. Investors wondering why crude oil prices are rising today should look to geopolitical tensions in Yemen. Saudi Arabia is leading a coalition of five Gulf States and Egypt against rebels in Yemen, news that is sending commodity prices much higher. Gold prices and the Japanese yen rose against the dollar, while Brent crude oil prices surged due to concerns over supply disruptions in the Middle East. Semiconductor Slump: Shares of SanDisk Corp. (Nasdaq: SNDK) cratered 18.45% this afternoon on news that the semiconductor giant slashed its 2015 sales outlook. The firm received several downgrades on the news and dragged down the broader sector on the day. The iShares PHLX Semiconductor ETF (Nasdaq: SOXX), the market's largest chip ETF, fell for the fourth consecutive day, down 1.37%. Searching for Answers: Shares of Deutsche Lufthansa AG (OTCMKTS ADR: DLAKY) fell more than 3% after details emerged from the crash of Germanwings Flight 9525. This morning, Lufthansa's CEO called the incident an "isolated tragedy" after prosecutors revealed that the co-pilot allegedly crashed the plane into the French Alps on purpose, killing 150 people on board. The co-pilot, Andreas Lubitz, had passed all training and psychological protocols. The plane's other pilot was locked out of the cockpit when Lubitz began the plane's decent. This is forcing other airline companies to quickly reassess their security protocols. Merger Mania: The markets are still reacting to the merger between Kraft Foods Group Inc. (Nasdaq: KRFT) and H.J. Heinz Co. Yesterday, Brazilian private equity giant 3G Capital announced it was partnering with Warren Buffett's Berkshire Hathaway (NYSE: A) to invest $10 billion into this merger. That has fueled more speculation on Buffett's next move. So what are the best Warren Buffett stocks, and what is the Oracle of Omaha planning for an encore? Go here for a breakdown of the best 10 Warren Buffett stocks to watch or own in 2015. Stretching Profits: Shares of yoga apparel giant Lululemon Athletica Inc. (Nasdaq: LULU) erased early gains to jump nearly 5% on the day. Although the company issued weak guidance for the first quarter, the firm reported stronger than expected earnings in the fourth quarter. The company blamed the weak quarterly outlook on the temporary West Coast port shutdown and a rising dollar. Apple a Day: Apple stock was up 0.7% this afternoon, paring some losses from yesterday's decline. Investors are speculating the company is likely to hike its cash dividend in April, returning capital to shareholders. Dividend hikes and stock buyback programs have long been the goal of activist investors who believe the tech giant should begin to return its massive cash on hand to its shareholders. In company news today, Apple Inc. (Nasdaq: AAPL) appointed Oscar-winning musician Trent Reznor to lead the redesign of its Beats Music service, while its Apple Pay service is being targeted by fraudsters and hackers. In the past year, Facebook stock has gained 23%. That's almost three times the 8% gain of the Dow Jones in the same period.